Recently we were sent a copy of review copies to check out for the kiddos. They always love receiving new books in the mail (they take after their mother) and the following titles were all declared a complete delight. 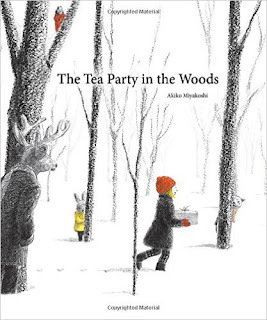 The Tea Party in the Woods , by Akiko Miyakoshi was the first book we read out of the stack. The author and illustrator lives in Tokyo, Japan which totally makes sense by the time you get to the end of the story (if the name of the author didn't tip you off in the first place). The simplicity and straightforwardness of both the story and the illustrations had a quality to them which tells you that this was not written by an American and sure enough it was first published in Japan. I don't really know how else to explain it but I began reading it before I looked at the author's name or bio and I just knew it didn't originate in America. It's clean, neat, and doesn't err on the side of the ridiculous, despite the story's magical tones. In this story we read about Kikko who sets out through the woods to bring a pie to her grandmother. Along the way she discovers a strange house full of animal occupants. She is invited in to tea and then the animals accompany Kikko to her grandmother's so that she will not be alone in the woods. She arrives at her grandmother's house, pie intact. Her grandmother opens up the door to welcome her in. "My dear, did you come all this way on your own?" asked Grandma, stepping inside. Kikko looked around, but the animals were nowhere to be seen. I absolutely loved this story. In fact, I'm fairly sure that it is going to rank as one of my favorite children's books ever. 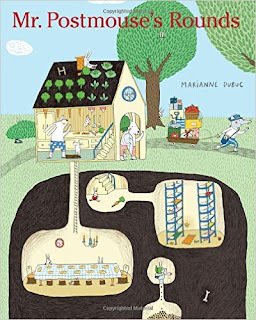 Mr. Postmouse's Rounds , by Marianne Dubuc could easily be considered the children's favorite out of this stack and I confess to its cuteness and likability. Curiously to me, this is also not written by an American author and it also shows. Dubuc lives in Quebec. You can tell this book is a little more "American" in that it includes some potty humor in the illustrations but the storyline is cute and you have to really look for the potty humor in order to find it. In this story Mr. Postmouse is out on his mail rounds, delivering the mail to animals everywhere. He climbs up into trees to deliver to the birds and puts on a scuba diving outfit to deliver to the clown fish in the coral. The super fun aspect of the book are the illustrations which are brilliant. We read the story and then went back through the book again simply to look at the pictures and see what there was to see. As Mr. Postmouse makes his deliveries, you get a glimpse into the animal homes and can see what they are up to and how their homes are decorated. It's very cute and fun. We highly recommend this one. I Can Roar! is by Frank Asch of Moon Bear fame. This is actually a reprint which is popping up for a new generation of young children to enjoy. (I thought I had seen this title before!) As you can sort of make out from the picture of the cover, the entire book has one gigantic hole cut out. This hole is so that you (or your child, but probably you) can stick your face into it and make the accompanying animal sound. 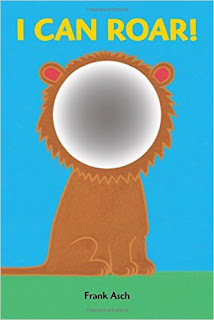 Put your face up to the book and roar like a lion, neigh like a horse, chew like a cow, bark like a dog, etc. My older kids were curious about this, having never seen anything like it. My three year old was in stitches, laughing. He can highly recommend this to you. By the way, I'd like to note that American children's book authors can be awesome in their own right. However, I do think that Americans these days tend to like things light, fluffy and rather ridiculous. More recently, too, we're so busy trying to make political points that we fail to tell good stories, forgetting that a good story is the best and only way to really make a point in the first place! We're so concerned with shoving messages in people's faces that we seem to care less about art and skill. We also seem to suffer from a notion that kids can't focus on anything for more than 2.2 seconds and so our modern stories seem to be full of bright colors, ridiculous-to-poorly written story lines and odd, random fonts. I can't say that I care for that. I so enjoyed the first two titles because they told a story in an engaging way and assumed that children could follow along without trying to be "over the top" in nabbing attention. Simple. Direct. Intelligent. These are the types of books I'm interested in surrounding my children with and I am very pleased with the above titles. Many thanks to Kids Can Press who sent the above titles my direction in order to facilitate this review. I received no additional compensation and all opinions are 100% my own. These all look good, especially the first one. The tea party sounds delightful! Much nicer than the big bad wolf! Thanks Carrie for those reviews of new picture books! We actually just checked out from the library & read another book by Dubuc called "The Lion & the Bird." It was our first book by her & it was a delight! A sweet, sweet tale of loyalty & friendship. (An especially helpful resource for your children if they have a dear friend that moves away.) I highly recommend it! The first two books are on my list! I agree with you on American authors, though I didn't really make that connection until you said it.